Think of the ToneRite as a tone conditioner. An instrument that hasn’t been broken in or hasn’t been played in a while can feel and sound a little tight, a little boxy and muted. The ToneRite treatment helps open it up. The difference can sometimes be subtle, but definitely noticeable. And sometimes it can be dramatic. A lot depends on the construction of the guitar and how much it’s been played in. 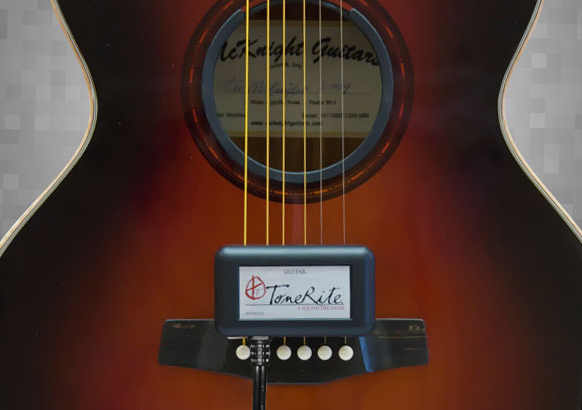 The ToneRite works by relieving the inherent tensions in wooden instruments. A new or even moderately played instrument has a tendency to have a lot of individual components that resonate independently. By transferring certain energies to an instrument, the ToneRite will help the instrument to resonate as a whole. As a result, your instrument becomes incredibly responsive, problem notes improve, the sound comes more quickly with less effort, and the overall quality of tone increases. I’m pretty good at sniffing out snake oil, and after a lot of research and my own trials, I believe this is the real deal for a couple of reasons. First, I haven’t found a single negative statement from anyone that’s actually used it, and some well-known names in luthiery have given it some high praise. Second, I watched ebay and craigslist for 2 years to find a used one with no luck. Things that aren’t useful tend to sit on the market for a while and sell cheap as people try to recoup their losses. With no used units for sale, it appears that people are pretty happy with it. I know that I was impressed with my initial results. Initial treatments from 72-144 hours are recommended.